Your old horse pictures became a little bit boring? What are you waiting then? Personalize your homescreen with the most beautiful horse wallpapers ever! Have a look and choose your next favourite horse images! These horse backgrounds are the wallpapers. Select the image you like the most and click on the set as wallpaper button in order to save the image into the saved photos. Follow the instructions in the How to Install section. To finish the process, go to start+theme and choose the photo you previously saved. Now you have your favourite wallpaper as a background. In order to have your favourite horse pictures saved, make sure you are connected to the internet. Once you download the horse wallpaper, they will be saved on your device. Wait no more! Horse images are ready for download. 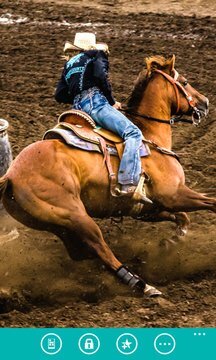 Horse Wallpapers provides the collection of amazing pics and pictures of horses you always dreamed about. Choose from a variety of horse wallpaper and set them as wallpapers for your lock screen or phone background. You could never imagine so many horse wallpapers in one place. Download horses wallpaper and set different horse backgrounds for your phone every single day. 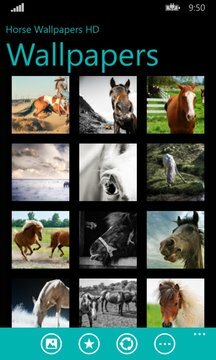 With a beautiful collection of horse wallpapers for free, now you have variety of options! Come on! Plain horse wallpapers are out of fashion! Choose these awesome live horse wallpaper instead! Hurry up & download the most beautiful horse wallpapers live now! We would really appreciate if you rate the latest wallpapers app – thank you in advance! Photos in Horse Wallpapers HD are licensed under Public Domain or Creative Commons licence. Credits to authors are provided inside the app. This app has been tested on the following devices (Phone 8, Phone 8.1): HTC 8S, HTC 8XT, Huawei Ascend W1, Huawei Ascend W2, Nokia Lumia 520, Nokia Lumia 521, Nokia Lumia 525, Nokia Lumia 620, Nokia Lumia 625, Nokia Lumia 720, Nokia Lumia 810, Nokia Lumia 820, Nokia Lumia 822, Samsung ATIV Odyssey, HTC 8X, Nokia Lumia 920, Nokia Lumia 925, Nokia Lumia 928, Nokia Lumia 1020, Nokia Lumia 1320, Samsung ATIV S, Samsung ATIV S Neo, Nokia Lumia Icon, Nokia Lumia 1520, Samsung ATIV SE, HTC One M8, Nokia Lumia 510.